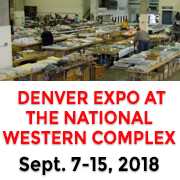 At this 52nd annual show (2019) , museums and private collectors will present cases featuring outstanding examples of rocks, gems, and minerals from Colorado and all over the world. 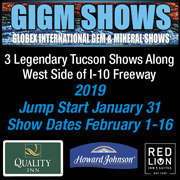 In addition to over 150 gem, mineral and jewelry dealers, the show highlights competitive and non-competitive exhibits, all required to conform to AFMS rules and regs, with prestigious prizes awarded to winners. Dealers at this show sell their mineralogical wares for prices that are affordable by the novice junior collector all the way up to museum-quality specimens purchased by the world's top curators and collectors. 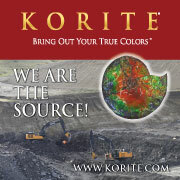 DGMS is a well-balanced combination of an internationally respected tradeshow, an education forum and meeting place for true rockhounds, and a family-oriented event. Every year there's Bones, the walking T-Rex; educational demonstrations and pamphlets; the fluorescent room with glowing rocks; free parking, gold panning; grab bags, pins posters; hobby demonstrations, and the ever-popular Kids' Corner! 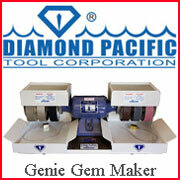 D & J Rare Gems, Ltd.
Harmon's Agate & Silver, Inc.